The adventures of bold Robin Hood and his merry men are by no means confined to Sherwood, nor are they even limited to English soil. It would indeed have been strange had the traditions of a figure of such outstanding mediaeval popularity failed to overflow into the neighbouring shire of York, when Northumbrian lore is full of his legends, and Scotland can boast of as many tales and ballads concerning him as of its own William Wallace, and can point to at least two localities as the grave of one of his followers. The odd thing is that while notices of Robin Hood's appearances in Yorkshire are of comparatively late origin, those relating to his activities in North Britain are to be found among the early passages of Scottish literature. But as we shall see, good reasons exist for such a condition of things, and it is not at all necessary to invent a Scottish exile for the romantic outlaw, even though his "game and play" was so popular at Edinburgh as to cause the most serious annoyance to the Reformers so late as 1565. It is Charlton in his "History of Whitby and Whitby Abbey", published at York in 1779, who affords us the best modern view of the movements of Robin Hood in Yorkshire. He tells us that in the latter years of the twelfth century Robin "resided generally in Nottinghamshire or the southern parts of Yorkshire". But his robberies became so flagrant and the popular outcry against him so loud that the whole nation grew alarmed at last, and troops were despatched from London to apprehend him. Unable to cope with the royal forces, the outlaw effected a retreat northward, crossing the moors which surrounded Whitby and gaining the sea-coast, where he provided himself with a number of small fishing vessels by which he could make his escape if necessary. 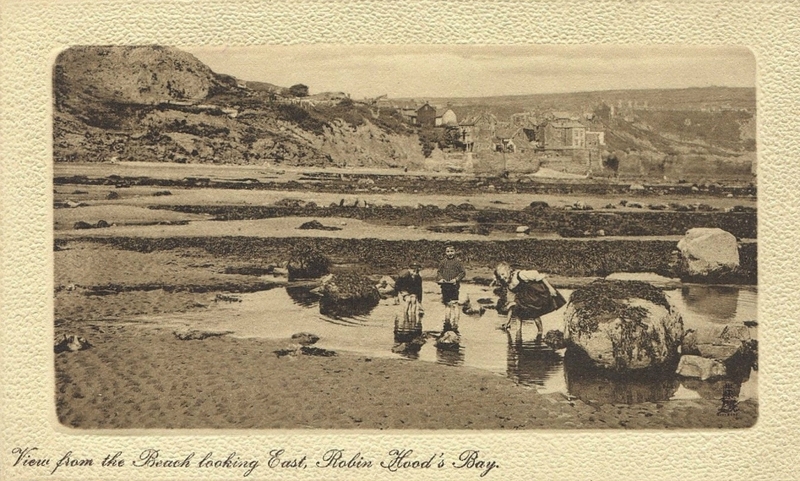 The place where his boats were kept in residence was the spot still known as Robin Hood's Bay, in the waters of which he and his men indulged in fishing. In the neighbourhood he set up butts or marks, where his band practised archery, so that they might not grow rusty in the use of the long bow. But, adds Charlton, the site commonly attributed to these butts, when excavated in 1771, was found to have been a pagan burial-place, although it seems probable that Robin used the low tumuli which covered the graves as suitable eminences on which to place targets. It is in another "History of Whitby", that by the Rev. George Young, published in 1817, that a deed of superhuman might is attributed to this bandit as a part of local tradition. We are informed that Robin and his trusty henchman Little John went to dine with one of the abbots of Whitby, and being desired by the prelate to try how far each of them could shoot an arrow, they loosed their shafts from the top of the abbey. The arrows fell on the west side of Whitby Lathes, "beside the lane leading from thence to Stainsacre, that of Robin Hood falling on the north side of the lane, and that of Little John about a hundred feet farther on the south side of the lane." In the spot where Robin's arrow is said to have lighted stands a stone pillar about a foot square and 4 feet high; and a similar pillar 24 feet high marks the place where John's arrow fell. The fields on the one side are called Robin Hood Closes, and those on the other Little John Closes. Tradition inevitably describes Robin Hood as "Earl of Huntingdon". But the researches of Gough at the end of the eighteenth century made it clear that his earldom had a popular sanction only, and indeed was nothing more than a nickname. The period of Robin's supposed career is generally fixed as between the years 1160 and 1247, during which time Malcolm IV, William the Lyon, and Alexander II, kings of Scotland, were undoubted holders of the title successively. As is well known, David I of Scotland became Earl of Huntingdon in right of his wife Matilda, the widow of Simon de St. Liz Earl of Northampton and Huntingdon, and in 1127 did homage to Henry I of England in respect of this title. This, of course, accounts for the great popularity of Robin Hood in Scotland, where his legend was probably introduced by Scots who had heard it at Huntingdon. But it is much more interesting to probe into the distant and possibly mythological origin of the famous forester than to speculate as to his nobility or lack of the same. Accurate historical notices of him are entirely wanting, and although it is not unlikely that the traditions respecting him may have become confused with the adventures of a veritable bandit who, with his followers, infested Sherwood Forest, many of the circumstances associated with them seem to point to a mythical origin for this romantic figure. In the first place his name is not a little suspect. Though usually spelt as "Hood", "Hude", or even "Whood", it is more rarely found as "Ood" and "Ooth". Now this may be only the old English "wod" or "wood", meaning "wild" and indeed Robin is surnamed "wild" by at least one ancient Scottish poet, while another alludes to him as "waith", that is "wild" or "wandering". But it seems more probable to the writer that the name, especially in its forms of Ooth and Whood, has reference to Odin, Odhin, or Othin, the Allfather of Norse mythology the Anglo-Saxon form of whose name was Woden, and who was originally the wind which bloweth where it lists. For Woden was the old wind-god, associated in later legend with the wild huntsman, and from him the royal Saxon houses of Deira and Bernicia claimed descent, and Deira as everybody knows, was a territory practically co-extensive with Yorkshire. Moreover, Odin was known to the later witchcraft of the northern counties as Hudikin, the prophetic familiar spirit. What more probable than that the cult and worship of the ancient god of the Angles and Danes of the North was, on the adoption of Christianity, forced to take refuge in the recesses of Sherwood, where legends of the deeds of its principal figures would remain for generations? There is traditional evidence, too, that Robin, and his men were not regarded as persons of mortal bulk. Hector Boece, describing the grave of Little John "in Murray Land" says that he was fourteen feet in height and the limbs of his body in due proportion. Indeed the old chronicler claimed to have examined his haunch-bone, in the "mouth" of which, he says, he was able to place one of his arms! Will Scarlet may, indeed, be a modern form of the name of Odin's brother Vill, and "Maid Marian" a corruption of Mardoll, one of the ancient names of Freya, his wife, while Allan-a-Dale might be equated with Ullr, the famous archer-god, who dwelt in the yew-forests, whence he procured the wood for his bows, and who took Odin's place when absent. In the course of ages the Norse pantheon, imprisoned in the green shadows of Sherwood, would emerge in the popular fancy as mere "foresters". beneficent to the descendants of those who had worshipped them, terrible to the Norman supplanters of their faith. But one must not wander too far upon the sands of surmise, and this provisional reading or an ancient story clamours for the aid of further faithful research. The hypothesis, however, is given here for what it is worth, and local examination of records and place-names may effect much in its favour, or assist in its demolition. Sir, Mr. Lewis Spence's article in "The Yorkshire Post" of January 16 is of exceptional interest to students of local history and folklore. In it he suggests that the origin of the Robin Hood tradition is mythological and connected with the Norse religion which, as Yorkshire place-names show, flooded the county until Christian times, and in which Odin was the chief divinity. He puts his suggestions no higher than conjecture and as subject to correction, but they appear reasonable, and the following remarks, which also are offered tentatively, may help to support them and to explain the name of the town from which I write. First, Yorkshire place-names testify to the wide diffusion in the county of the Scandinavian religion and the names of the gods of its pantheon. Wensleydale is Wotan's Dale, and appropriately contains Asgard (now Aysgarth), the Norse equivalent to the garden of Eden. Thor left his name at Thirsk, Thoralby, Thurstonland, and Thurgoland; Freia had her shrines at Fryston, Fridaythorpe and Frizinghall, each of these places having been a primitive religious centre. But the chief god Odin or Wotan, who, in Mr. Spence's submission, became anthropomorphised into Robin Hood, seems also to have provided Huddersfield with its name. Huddersfield is pretty certainly Hood's or Odin's field, and in local speech is still called "Hoodersfeld" or "Uthersfeld." Domesday Book gives it as Odersfeld Oder being a form of both Odin and Uther (who, by the way, was the demigod father of another legendary hero, King Arthur, or Ar-Thor); its site is usually regarded as having once been the property of a primitive landowner named Oder, whereas more probably it was the "field" (district or parish) of Odin worship; no doubt, too an important centre, since near the town are also found Woodsome (Hood's home), Woodhouse (Hood nawse, or ridge), and Woodhead (Hood's hill or headland), whilst Robin Hood's reputed grave is at Kirklees, near Mirfield, where once stood a Christian monastic house and probably a pagan altar before that. The Yorkshire tongue has twisted "hood" into "wood" as it converts "home" into "whom". And the Huddersfield district seems to be in respect of place-names more redolent of Robin Hood and Odinism than the Sherwood Forest, with which Robin is popularly associated. The name Odin takes many other forms than Hood; it links up with the Irish "Aodh", the Hebrew letter "Yod" and the English "God" and even "Buddha" is an Eastern variant of Wotan; thus pointing to some primeval root-name for Deity which has undergone numerous local modifications. From Odin we also get the word "odd" as applied to a person who holds unusual views, and which was formerly "wood". "He is wood" occurs in Shakespeare, and means mad, fanatical; but earlier still it probably meant an Odin-worshipper, or as one might say, in the dialect, a "Hoodersfielder". Next we have to account (as Mr. Spence partially does) for Odin worship becoming reduced and travestied into the legend of Robin Hood and his bandits. This is not difficult when we recall the parallel Arthurian legend, which is recognised as a solar myth re-expressed in terms of Christian chivalry. King Arthur and his knights impersonate a divine ruler and his officers governing the world (or round table). Similarly the legend of Robin Hood is myth expressed in terms of forestry and one appropriate to an uncivilised age when England was so densely wooded that, as Macaulay said, a monkey, swinging from tree to tree, might have travelled from Newcastle to London without touching ground. Robin Hood was Odin writ small and personalised; his "merry men" correspond with Arthur's knights; they went about protecting the forest tribes from wild beasts, keeping the peace and redressing human ills. Later, in time, as the land became civilised, their beneficent activities became satirised as banditry and, with changes in religion, the old gods and saviours were regarded as reprobates and outlaws. In all religions one finds a chief god or demigod with a bevy of subordinates who execute his orders; even Christianity has its central Master and twelve apostles; so that, here again, we trace a common root idea underlying all religions, the more advanced ones taking over and reproducing the. main features of the earlier. One may go farther and suggest that in Little John, Robin Hood's favourite comrade, there is a possible equating with John, the "beloved disciple"; whilst pretty certainly Maid Marian is to be identified (like the Irish Brigit) with the Virgin Mary. Close to Robin Hood's reputed grave is Mirfield, which may be Mary's field, just as Prizinghall is "Freia's Ing" (or field), one of Freia's other names having been Mardoll. Finally, Robin Hood's traditional feats of archery may well be due to the literalising of a religious idea. Divine influences, like the solar rays, are always found symbolised by arrows shot by the Sun-god (Ra or Apollo); even the Hebrew Psalmist praying for deliverance from his enemies uses the phrase "Shoot out thine arrows and destroy them". So when we find stones (as at Whitby, Kirklees, and elsewhere) indicating the places where Robin Hood's and Little John's arrows fell, we may reasonably infer them as marking the site of an ancient religious cult and associate them with such similar stones as the "Devil's Arrows" at Boroughbridge. Once they were pagan religious centres, but upon our country becoming Christianised these old stones came to be regarded as sinister and attributed to ancient powers of evil. An Icelandic-English Dictionary based on the manuscript collections of the Late Richard Cleasby, enlarged and completed by Gudbrand Vigfusson, M.A. hangi, a, masculine, a law term, a body hanging on a gallows, Fornmanna Sögur v. 212: the mythological phrase, sitja, setjask undir hanga, to sit under a gallows, of Odin, in order to acquire wisdom or knowledge of the future; for this superstition see Ynglinga Saga ch. 7; whence Odin is called hanga-guð, hanga-dróttinn, hanga-týr, the god or lord of the hanged, Edda 14, 49, Lexicon Poëticum by Sveinbjörn Egilsson, 1860; varðat ek fróðr und forsum | fór ek aldregi at göldrum | … nam ek eigi Yggjar feng und hanga, I became not wise under waterfalls, I never dealt in witchcraft, I did not get the share of Odin (i.e. the poetical gift) under the gallows, i.e. I am no adept in poetry, Jómsvíkinga-drápa 3 (MS., left out in the printed edition). According to another and, as it seems, a truer and older myth, Odin himself was represented as hangi, hanging on the tree Ygg-drasil, and from the depths beneath taking up the hidden mystery of wisdom, Hává-mál 139; so it is possible that his nicknames refer to that; compare also the curious tale of the blind tailor in Grimm's Märchen, No. 107, which recalls to mind the heathen tale of the one-eyed Odin sitting under the gallows. hangr, m. a hank, coil; það er hangr á því, there is a coil (difficulty) in the matter. 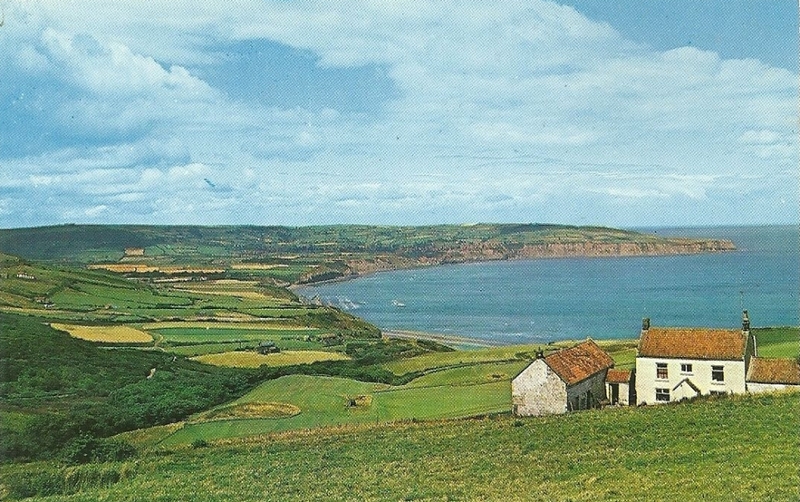 Millions of years ago, the land upon which Robin Hood's Bay is situated was once a deep sea. The sea animals of the time, buried in the mud, became fossilised, providing one of the best sources in Britain for the fossil hunter. Some of these fossils can be seen on display in the museum and can still be picked up on the beach if you look carefully. The scaurs (derived from a Norse word meaning 'rock') exposed at low tide, were formed 170 million years ago and consist of limestone and blue shale. A wealth of sea life can be found in the rock pools at low tide. 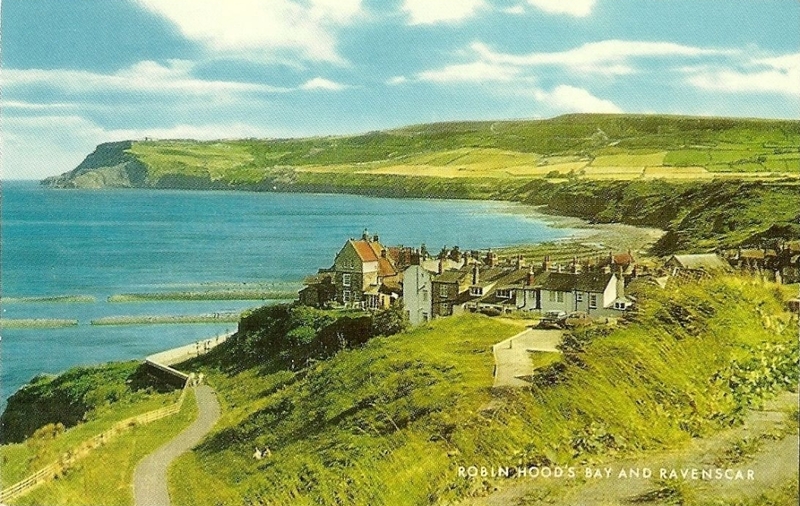 Robin Hood's Bay lies in the ancient parish of Fylingdales. The name itself is believed to be derived from the Old English word 'Fygela' which meant 'marshy ground'. The first evidence of man in the area was 3000 years ago when Bronze Age burial grounds were dug on the high moorland a mile or so south of the village. These are known as Robin Hood's Butts. Some 1500 years later, Roman soldiers had a stone signal tower built at Ravenscar about the 4th century AD. The first regular settlers, however, were probably Saxon peasants, followed by the Norsemen. The main colonists of this coast were Norwegians who were probably attracted by the rich glacial soil and ample fish, and this is how they survived by a mixture of farming and fishing. The likely original settlement of the Norsemen was at Raw, a hamlet slightly inland, which helped to avoid detection by other pirates. After the Norman Conquest, the Manor of Fyling was given as the spoils of war to one of William the Conqueror's relatives, Hugh of Chester. Eventually, it passed to the Percy family who gave the land to Whitby Abbey. 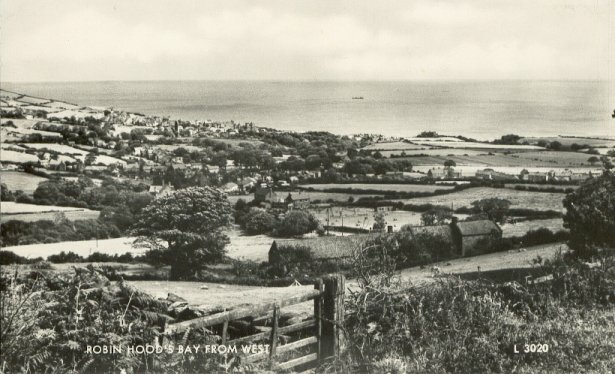 The first recorded reference to Robin Hood's Bay was in 1536 by King Henry VIII's topographer, Leland, who described 'a fischer townelet of 20 bootes with Dok or Bosom of a mile yn length'. By now the cliff settlement had grown larger than the inland settlement, probably because they felt more secure from piracy and because it would be more convenient to walk from the boats. By 1540, the village was said to have fifty cottages by the shore (a large settlement at that time) so we can speculate that the present village originated somewhere in the 15th century. In 1540, the chief tenant was Matthew Storm and his descendants still live in the area. At the dissolution of the monasteries in 1539, the land passed to the King who sold it to the Earl of Warwick. The Cholmleys and then the Stricklands became the final 'Lords of the Manor'. 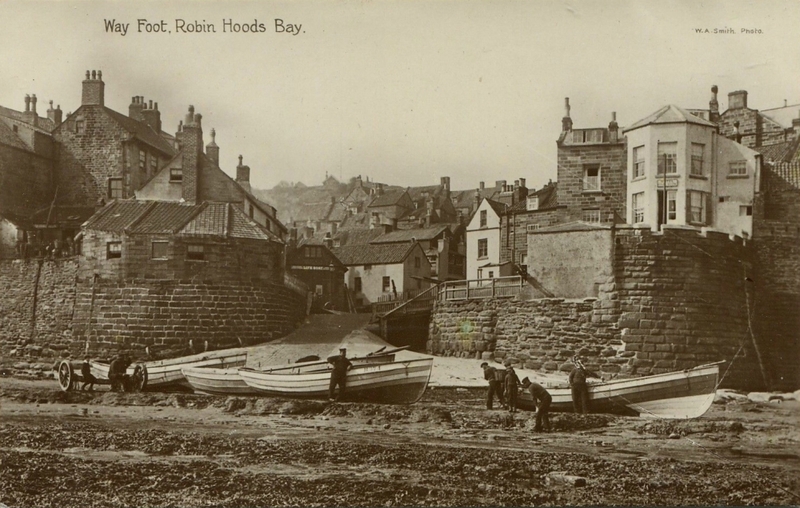 It appears that in the 16th century, Robin Hood's Bay was far more important than Whitby. In a series of Dutch sea charts published in 1586, Robin Hood's Bay is indicated while Whitby is not even mentioned. The actual origin of the name remains a mystery. There is not a scrap of evidence to suggest that Robin Hood of Sherwood Forest folklore visited the Bay. The name is more likely to have grown from legends with local origin and probably from more than one legend. Robin Hood was the name of an ancöient forest spirit similar to Robin Goodfellow and the use of the name for such an elf or spirit was widespread in the country. Many natural features were named after these local folk of legend and, in time, stories crossed over from one legend to another. The traditional anecdotes probably go way back in time but as to their origin - who knows? What we are more certain of is that in the 18th century, Robin Hood's Bay was reportedly the busiest smuggling community on the Yorkshire coast. Its natural isolation, protected by marshy moorland on three sides, offered a natural aid to this well-organised business which, despite its dangers, must have paid better than fishing. Smuggling at sea was backed up by many on land who were willing to finance and transport contraband. Fisherfolk, farmers clergy and gentry alike were all involved. Fierce battles ensued between smugglers and excise men, both at sea and on land, and Bay wives were known to pour boiling water over excise men from bedroom windows in the narrow alleyways. Hiding places, bolt holes and secret passages abounded. It is said that a bale of silk could pass from the bottom of the village to the top without leaving the houses. The threat of the excise men was not the only danger to Bayfolk. In the late 18th century and early 19th century, the Press Gangs were feared and hated. Sailors and fishermen were supposed to be exempt but, in reality, rarely were. Once 'pressed', their chances of returning to their homes were not high. Village women would beat a drum to warn the men folk that the Press Gangs had arrived and it was not unusual for the Press Gang to be attacked and beaten off. The fishing industry reached its zenith in the mid 19th century and a thriving community existed in Bay. The townsfolk liked to amuse themselves in the winter and there were dances almost every evening. Church and chapel were well attended and funerals and weddings were occasions for a festival. Like other fishing villages, Bay had its own gansey pattern. From the early 19th century, Robin Hood's Bay began to attract visitors from the outside and this has continued to the present day. With grateful thanks to the Fylingdales Local History Group. The following sources are taken from An Icelandic-English Dictionary based on the manuscript collections of the Late Richard Cleasby enlarged and completed by Gudbrand Vigfusson, M.A. HÖTTR, m., hattar, hetti, accusative plural höttu, a later form hattr, Droplaugar-sona Saga 13, Egils Saga. 407, Njála 32, 46, Gísla Saga 55, Ólafs Saga Helga Legendaria 46, as also in modern usage; [the Anglo Saxon hôd, English hood, Old High German huot, Dutch hoed, German hut may perhaps be identical; but Anglo Saxon hæt, English, Danish, and Swedish hat certainly answer to the old höttr, compare also hetta, q. v.]: - a hood, in olden times only a cowl fastened to a cloak, as is seen from numerous instances … Odin is represented wearing a hött, and so the helmet is called the hood of Odin, etc. ; as also Ála höttr: the vaulted sky is foldar höttr = earth's hood, Lexicon Poëticum by Sveinbjörn Egilsson, 1860: dular-höttr, huldar-höttr, a hiding hood, hood of disguise. hattar-maðr, m. a hooded man, man in disguise, Reykdæla Saga 272; Síð-höttr 'Deep-hood' was a favourite name of Odin from his travelling in disguise, compare Robin Hood. III. a proper name, Fornaldar Sögur. HROPTR, m. a mythical name of Odin, perhaps the crier, prophet (from hrópa), Grímnis-mál. 8, Kormak, Völuspá. 61, Loka-senna 45, Eyrbyggja Saga 78 (in a verse), Hús-drápa (Edda); properly an appellative, as seen from the compounds Rögna-hroptr, m. the crier of the gods, the prophet = Odin, Hává-mál 143; Hropta-týr, m. the crying god = Odin, Hává-mál 161, Grímnis-mál 54. Editor's note: the forename Robert (Robin) could be derived from Hropta as the earliest written references are to 'Robert Hood' - see above "whence the poets call the helmet the hood of Odin (Hropts höttr)" or 'Robert Hood'. 'Robin Oed's Bay' is mentioned in correspondence from the years 1324 to 1346, between the Count of Flanders and King Edward (Ancient Correspondence of the Chancery and the Exchequer, National Archives, SC1/33/202). The record was discovered by Robert Lynley. 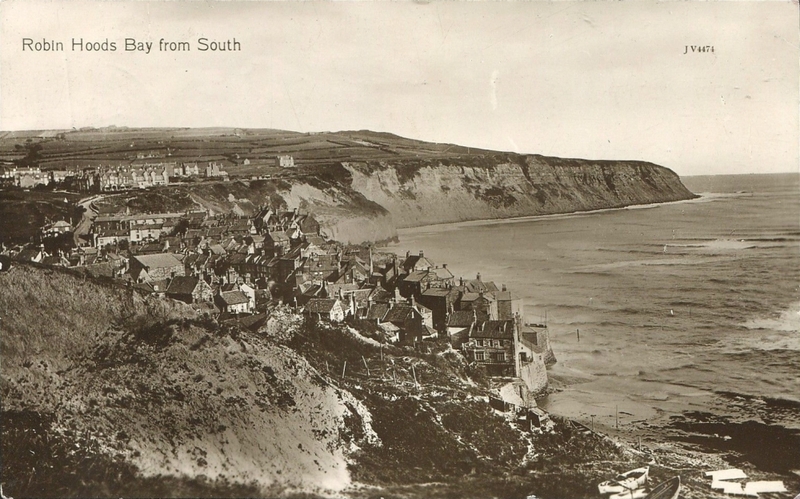 This place later became known as 'Robin Hood's Bay' (Yorkshire, North Riding). 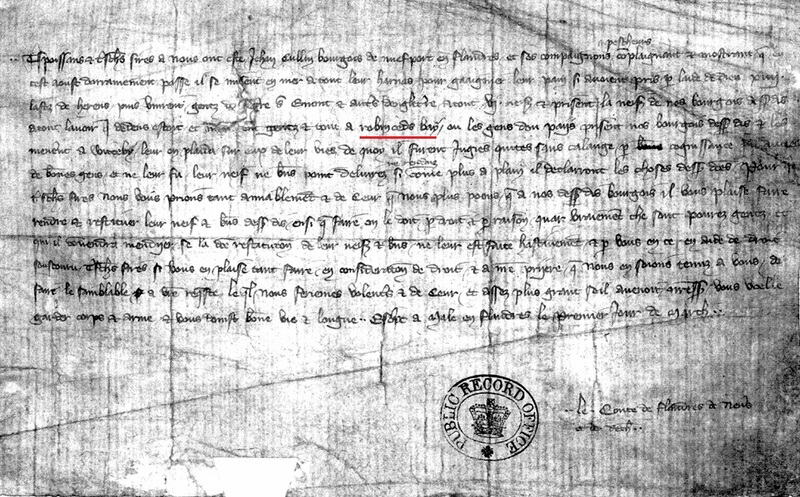 See International Robin Hood Bibliography for a translation of the Robert Lynley letter. Robin Hood: One mile north of Catterick Bridge. A small hamlet along the course of the old Great North Road or Roman Dere Street. Robin Hood's Bay: 12 miles north of Scarborough. A fishing village on the north side of the bay of the same name. One of the oldest and most intriguing of all Robin Hood place-names, in use by at least the early sixteenth century: see 'Robyn Hoodis Baye' in 1544, Letters and Papers of Henry VIII, XIX, i, p. 224; Leland's Itinerary, Toulmin Smith, I, 51; G. Young, History of Whitby, 1817, II, 647. The suggestion that the name was taken from a tumulus called 'Robbed Howe' near the neighbouring village of Sneaton is probably unlikely (V.C.H. Yorkshire, North Riding, II, 534). A place-name associated, but probably long after its formation, with the Robin Hood ballad of The Noble Fisherman. This place was named 'Robin Oed's Bay' in letters of correspondence between the Count of Flanders and King Edward from the years 1324 to 1346. The origins of the name are unknown. Robin Hood's Butts: two miles north of Danby. Three tumuli on Danby Low Moor and others further north of Gerrick Moor towards Skelton. Robin Hood's Butts: six miles west of Barnard Castle. 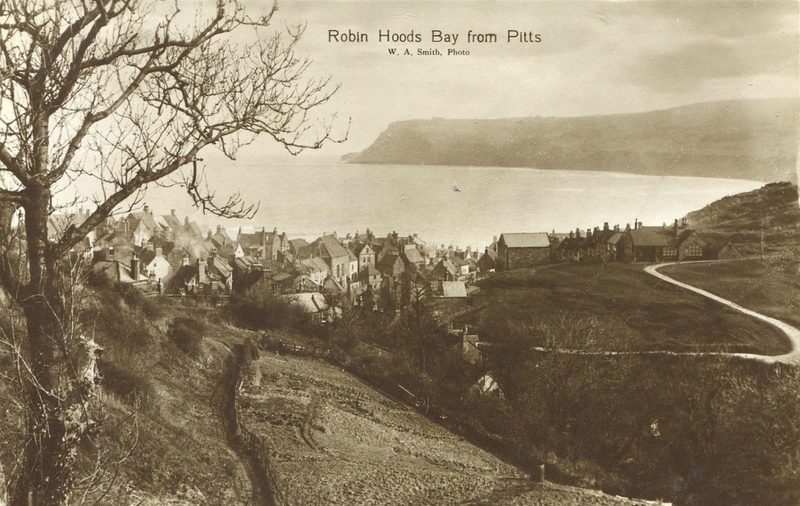 Robin Hood's Butts: two miles south of Robin Hood's Bay. Three tumuli, about a mile from the sea and 775 feet above sea-level, south of a beacon at Stoupe Brow. They probably derive their name from Robin Hood's Bay which they overlook. Robin Hood's Howl: one mile west of Kirkbymoorside. Appears to be a hole or hollow on the southern escarpment of the North Yorkshire Moors: Ekwall, Concise Oxford Dictionary of English Place-Names, 1960 edn., p. 254. Robin Hood and Little John Inn, Castleton: now probably the most famous of all inns named after Robin Hood. The building itself can be dated to 1671 on the evidence of the inscription on the lintel over the door; but no precise date can be given for the origins of the myth (still prevalent in Castleton) that Robin Hood and Little John met here for the last time. Robin Hood's Tower: Richmond Castle. An 11th century tower projecting from the curtain wall of Richmond Castle; probably named only after the 15th century. Robin Hood's Well: three miles south-west of Wensley. A well at the source of a hill stream on Melmerby Moor south of Wensleydale. Whitby: Robin Hood's Close and Little John's Close: two adjacent fields immediately west of Whitby Laithes, recorded as such in a land conveyance of 1713 (Young, History of Whitby, II, 647). They owed their names to two monoliths, one 4ft and the other 2½ft high, which stood at the side of the two fields, to the north of the lane that leads from Whitby Laithes to Stainsacre. These stones (a 'Robin Hood's Stone') occur as early as 1540: Cartularium Abbathiae de Whiteby, II, 727 and traditionally mark the points at which arrows shot by Robin Hood and Little John from the top of Whitby Abbey reached the ground: see L. Charlton, History of Whitby and Whitby Abbey (York, 1779), pp. 146-7; C. Platt, The Monastic Grange in Medieval England, 1969, p. 244; V.C.H. Yorkshire, North Riding, II, 506. The medieval records of England provide us with a variety of thirteenth and fourteenth century persons of the surname Hood. Rather than being linked to Scandinavian or Germanic deities like Hodeken, Woden or Hodr, the surname could have originated from the English word for a head-covering; a Hood - Anglo Saxon hôd, English hood. The most common mediæeval spellings are Hod and Hode, and there are also records of the surname Robynhod. Occasionaly the Robin Hood of legend is transformed into Robin Wood or Whood. Robert was a common Christian name in post-Conquest England, and in the 13th century its alternative form of Robin was probably as common as Robert. It is suggested that the famous outlaw's name is an alias or nom de plume (e.g. John or Jane Doe), but there appears to be little evidence to support this theory.